In 1839, the Milwaukee area’s earliest Norwegian settlers arrived at Muskego Lake in search of better economic prospects and freedom from the doctrinal strictures of the State Church of Norway (Lutheran). While some settled in Milwaukee, most used the city as an entry point into Wisconsin and Illinois’ larger Norwegian communities. Still, Norwegian-Americans living in Milwaukee facilitated this process by introducing their compatriots to the area, providing people with access to regional markets, and guiding immigrants through the city’s lakeside ports. Wisconsin maintained the nation’s highest population of Norwegians until 1870. Leading a group of forty immigrants from Telemark (Telemarken), Norway in 1839, John Nielsen Luraas helped found the Muskego Settlement in the present-day RACINE COUNTY Town of Norway. Muskego settlers established the first Norwegian-American newspaper, Nordlyset (The Northern Light), in 1847. Among them was James D. Reymert, an immigrant who arrived in Wisconsin in the early 1840s. Reymert served as a Muskego settlement delegate to the second Wisconsin State Constitutional Convention (1847-1848) and represented Racine County as a Wisconsin assemblyperson in 1849. 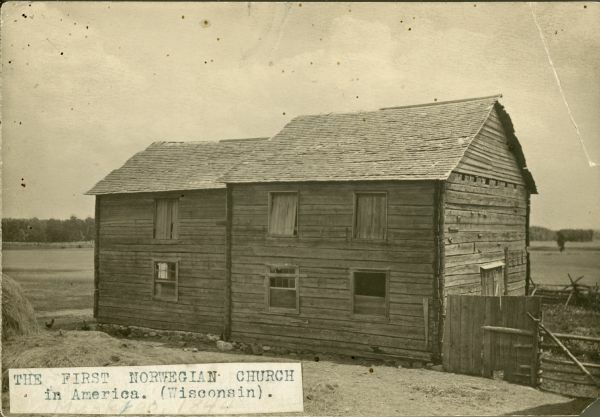 Muskego settlers also organized the first American congregation of the Norwegian Lutheran Church (1843). Predominantly farmers in their home country, Muskego’s Norwegian settlers established farms soon after arriving in southeast Wisconsin. Though they possessed little wealth, residents took advantage of the Milwaukee area’s developing trade networks to barter goods. Between 1849 and 1851, cholera ravaged the Muskego settlement, killing scores of settlers. Many survivors left the swampy, contaminated area for other Norwegian settlements, such as Koshkonong in Dane County or Jefferson Prairie in present-day Rock County. The majority of Norwegians in Milwaukee during the nineteenth century resided in Walker’s Point on the South Side. This location provided a short commute to the city’s emergent lakeside port, where Norwegians held jobs as mariners, shipbuilders, and boat captains. Others worked seasonally, often in the fall and winter, helping to clear the region’s dense forests. Norwegians also found employment during the warmer months operating the Milwaukee River ferries connecting Kilbourntown and Juneautown. By 1900, the city’s Norwegian-born population approached 2,000, augmented by a late-nineteenth century spike in immigration. Milwaukee remained a way station for newly arrived migrants throughout the nineteenth and early twentieth centuries, helping Wisconsin’s various Norwegian communities grow and assimilate. By 1950, the city no longer counted many first-generation Norwegian Americans as residents. The state’s Norwegian population remained numerically strong. As of 2005, residents of Norwegian ancestry comprised the fourth-largest white ethnic group in the state. In 2011, some 37,000 people in the Milwaukee metropolitan area (2.3 percent of the population) reported Norwegian as their primary ancestry in the American Community Survey. Rasmus Björn Anderson, The First Chapter of Norwegian Immigration, 1821-1840, Its Causes and Results (Madison: Rasmus B. Anderson, 1895), 273-274, 313-314; Leola Nelson Bermann, Americans from Norway (Philadelphia: J.B. Lippincott Company, 1950), 70; U.S. Bureau of the Census, Birthplace–Norway, 1840, tabulated at http://www.ipums.org. ^ Anderson, The First Chapter of Norwegian Immigration, 268-269, 276-277; “Old Muskego (Historic Marker Erected 1963,” Wisconsin Historical Society, http://www.wisconsinhistory.org/dictionary/index.asp?action=view&term_id=12110&keyword=Muskego+Settlement, accessed October 13, 2011; Bergmann, Americans from Norway, 171; “Reymert, James De Noon 1821-1896,” Wisconsin Historical Society http://www.wisconsinhistory.org/dictionary/index.asp?action=view&term_id=1691&keyword=norwegian, accessed November 1, 2011. ^ Anderson, The First Chapter of Norwegian Immigration, 162, 321-322, 390. Anderson, The First Chapter of Norwegian Immigration, 313-314; John Gurda, The Making of Milwaukee, 3rd ed. (Milwaukee, WI: Milwaukee County Historical Society, 2006), 66-67; 2011 counts tabulated from IPUMS-USA, University of Minnesota, www.ipums.org. ^ U.S. Bureau of the Census, Milwaukee Norwegian Maternal Nativity, 1970; U.S. Bureau of the Census, Wisconsin Norwegian Ancestry—First Response, 2005. Both tabulated at http://www.ipums.org. Anderson, Rasmus Björn. The First Chapter of Norwegian Immigration, 1821-1840. Fourth Edition. Madison: Rasmus B. Anderson, 1906.